« Cabelas King Kat Tournament Trail – Camden, SC. Tournament Info: The Fort Lauderdale Meat Mayhem is taking place April 25th-28th, 2019. Awards will be held Sunday following the event. 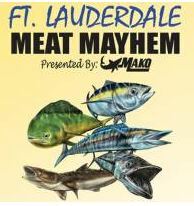 The Fort Lauderdale Meat Mayhem is where it all started, and has become our largest tournament . Huge payouts draw teams from all over to come fish this great event! With a high number of participants, a wide variety of eligible species and teams weighing up to 10 fish, this tournament lives up to The Mayhem Title! Registration will be announced here when open! See you at The Mayhem!